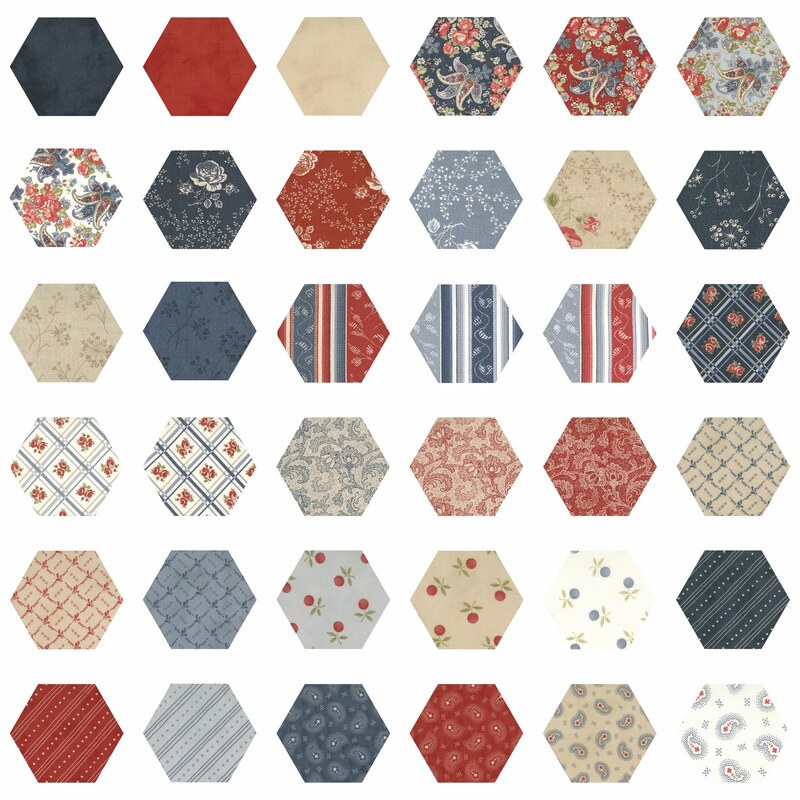 I've been a bit quiet this past week, but I've been a little busy making new pre-cut fabric hexagons for my store, and busy making better pictures to give you a clearer idea of what's available. I like the colours in this range, Etchings by 3 Sisters for Moda, but I have to admit that every time I get a new fabric range it automatically becomes my "new favourite". I'm sure you can relate. Before I go any further, I need to stop for a minute and draw the winner of the giveaway. OK I'm back. Sorry I took so long, I said that I'd have an international winner and an Australian winner, but I kept drawing international names. The international winner is Henria O. from SazzyFrazz Says, and if elliek is an Aussie, then she's my Australian winner. 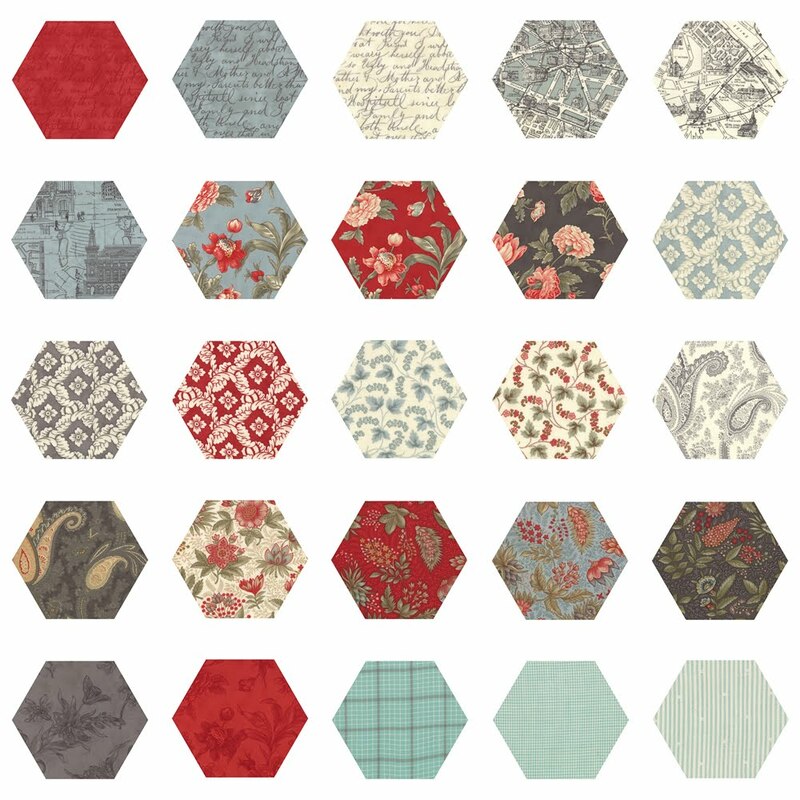 Congratulations, you each win a pack of 50 fabric hexagons in 50 different colours, plus one pack containing 100 of my 1" paper or card hexagons. I'll email you shortly. 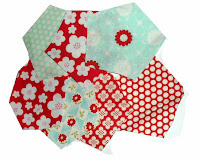 I've sold out of the packs of 50 different coloured hexagons but I have orderd Moda's Bella Solids in all sorts of colours so that I can make some new packs. There were quite a few suggestions to make some from Terrain, and I will ... as soon as I can get my hands on some! Here's what's new in my store, packs of pre-cut fabric hexagons made from the Clermont Farm and Strawberry Fields ranges from Moda. 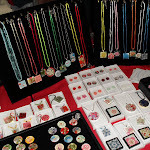 I have also added Collection for a Cause - Hope, and I still have some Curio, Etchings and some other ranges available. 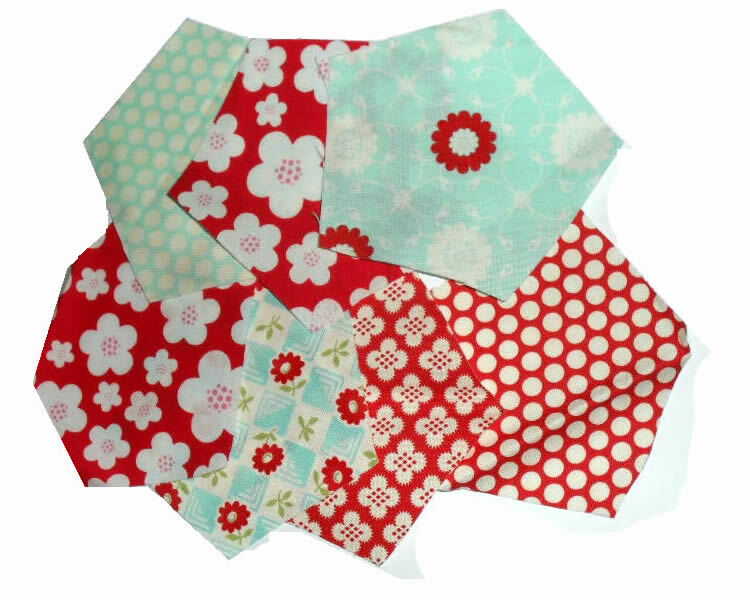 These are all in the 1 & 1/2" sides size, suitable for use with 1" templates. I hope you find that these specialist pre-cuts save you lots of time and effort. 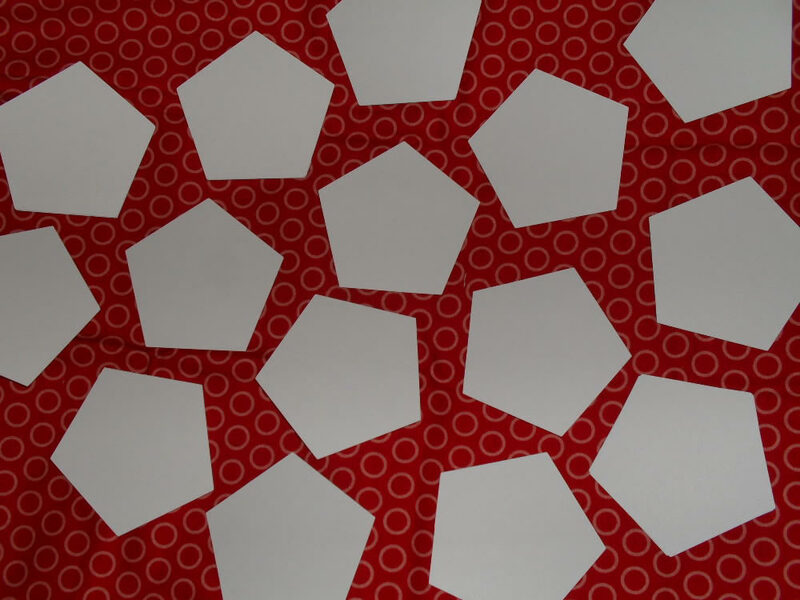 It's been a while since I last used my wonderful electronic cutter, so when Doris (who organises the Hexagon Flower Swap on Our Craft Forum) asked me to make some pentagon templates for her, I was more than happy to oblige. I cut out a pack of card pentagons in no time at all, and while I was at it I thought why not cut some for myself too. 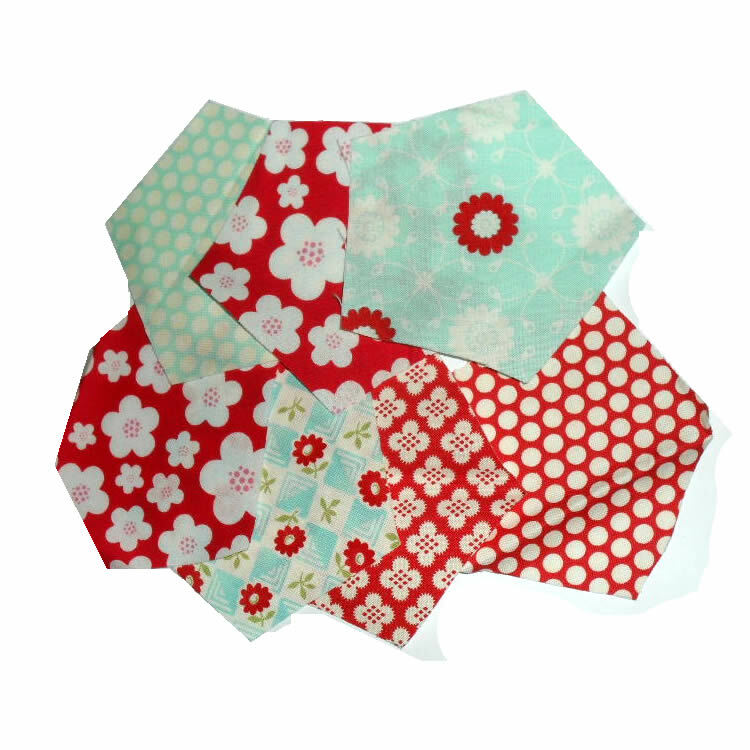 A change from sewing hexies could be nice, so I also cut out some fabric penties. Oh, I don't think I should call them that. 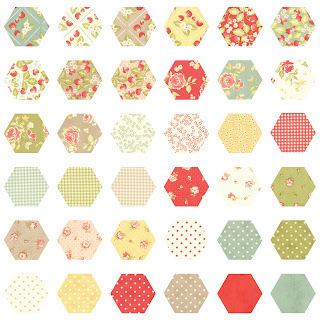 Fabric pentagons it is. 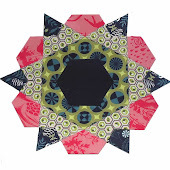 When Doris mentioned that she was making pentagons, I was reminded of my first ever patchwork project, made when I was about 12 years old. It was a ball made from felt pentagons in baby colours, blanket-stitched together, made for my guitar teacher's pregnant wife. Thanks for teaching me Mum! I was also reminded of a FANTASTIC book by Jinny Beyer called Patchwork Puzzle Balls. I don't know what happened to my copy, but I remember that as well as having great piecing projects - from simple to complex - it had some really smart patterns to help you assemble the different balls. It's getting late so I'll have to wait till tomorrow night to have a go at stitching this pentagon ball. And I am tempted to try making this one too. It looks like a mix of pentagons and triangles, but I think I might need a pattern for assembling this one. I'm glad this book is still available as I think I might have to buy another copy. 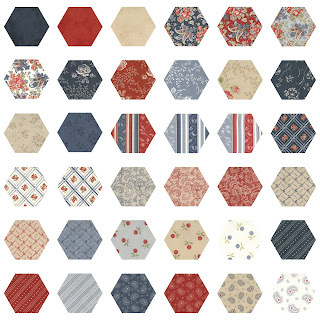 Ooh, I just discovered the Free Patterns section on jinnybeyer.com so I'm going to rush off now. Bye. Please hurry up Mr Postman!